Being an independent developer has certain advantages. In many cases, the developer is not locked into any specific time frame to get a game released, which means it can take the necessary time to polish a product, and, if desirable, release versions of the game to the fans to try out. Introversion Software is positioned for just such a model. The developer of the unique DEFCON, Darwinia, and Uplink is once again hard at work on another clever title, and is giving the players alpha access as well as the chance to contribute feedback and have a valuable role in the course of development of the game. Concerning the alpha, Introversion rolls out a new feature or set of features for the game with each new alpha version. I’ve designed this series as a way of taking a look at each version of the alpha to see what new goodies Introversion has added into the game. If I’ve done my job by convincing you to give the game a try, you can go to the Prison Architect website and purchase alpha access for $30. The payoff is a deep game that also grants access to a forum where players can request new features, as well as active involvement and frequent updates (about one major update each month) from Introversion. In that sense, it is almost constantly evolving, and absolutely worth it. For the introductory article, let’s first look at what exactly this game is. 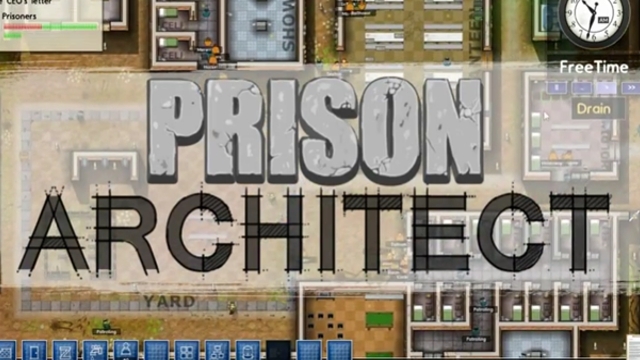 The core idea of Prison Architect is, you guessed it, to design a prison. This begins literally with an empty field and a sum of money, and a set of objects and materials to be used in constructing the prison. From there, you can build the prison from the ground up, constructing rooms and structures, stationing guards, laying pipes and wiring to make sure each part of the prison has the necessary utilities, and making sure everything is secure and safe. The brilliance of Prison Architect lies under the hood, in the myriad of options at your disposal that lead to different outcomes. The effects of these options are not immediately evident, which requires careful thinking in terms of what gets put in the prison. A broader idea of this system at work is the difference between a more fascist prison system that dominates the lives of the inmates, and a more therapeutic system that focuses on the psychological rehabilitation of the inmates. One or the other may have a positive effect on inmate violence, depending on how they are handled. It goes deeper, however. Building placement also has an effect on prisoner behavior; it seems that even making an inmate walk too far from his cell to his meal may make him more likely to act violently towards another inmate. Buildings can be zoned to only be accessible to certain members of staff, which can make things significantly more or less efficient based on how they’re done. True to form, Introversion went the extra mile for realism. Each prisoner has his own name and list of crimes. The fun part about the latter is that some of the crimes for which the prisoner was convicted may not have actually been committed; for example, one prisoner that pleads Not Guilty to serial killing but still got convicted may not have actually done it and therefore likely doesn’t pose a threat. He may be better suited to the cheaper minimum security status. I am a bit late to the game here, but gameplay additions so far have included Fog of War, CCTV cameras, emergency services, and prisoner “levels” (minimum/maximum security). From here on out, I will closely describe and examine each new alpha update. The most recent gameplay additions and features came in Alphas 7 and 8. The first addition Introversion made was that certain doors cannot be opened without a guard. This is important, because previously prisoners could pretty much walk through any door. Now, prisoners can still open their jail cell door from the outside, but a guard must be present inside or outside other rooms of the prison in order to admit a prisoner. This, as you can imagine, can quite change the way the prison is run, as guard distribution must be more seriously considered in order to help move prisoners—the alternative is that prisoners left waiting outside the Canteen for too long will grow angry and may riot. Two buttons have been added to the Emergency menu at the bottom of the screen: “BangUp” and “LockDown.” The former issues the order for every prisoner in the facility to return to their cells (granted, of course, that the prisoners want to follow orders). The latter seals every single lockable door in the facility, ensuring that no one can enter or leave the rooms they are in. This is a useful feature in case a prisoner is trying to escape. In Alpha 8, Introversion made the addition of Staff doors. These doors are accessible by any member of staff, and eliminate having to have guards waiting around to let the cook into the kitchen. Other minor door-themed tweaks include options to keep an entire sector unlocked and open (in case you need to build some new objects inside and the workers need access), and setting individual doors to stay open or closed at all times. A welcome feature for larger prisons is the slight reworking on prisoner AI which directs them to the nearest facility (canteen, shower) instead of having them randomly seek out any of the number of showers or canteens in the prison. This saves time and prisoner happiness when they can travel a short distance to the nearest shower instead of trying to get to the shower halfway across the map. My personal favorite addition to the alpha is Planning mode, which is essentially a building mode, however nothing actually gets built; the building can be traced on the ground, and left there as an imprint for planning ahead with new facility additions without having to worry about spending the money and resources right away. This particularly useful once more prisoners start arriving and one has to be more creative with the way space is utilized. Perhaps the most major new feature in Alpha 8—Steam support! Now, when you join the beta, you also get a Steam key which allows you to install the game onto Steam. This, of course, will eventually allow for Steam cloud saves so you can continue your game on another computer, and possibly Steam Workshop map sharing. You’ll also get the updates automatically, which is always convenient. That about covers the latest updates. You can expect another nice article about the newest additions the game when Introversion rolls out the next version of the Alpha in about a month’s time. For now, you can visit the game’s website at www.prison-architect.com. Your $30 will go significantly farther than you may think, and even in an early alpha, the game is already terrific.